Definition at line 132 of file ntuser.h. Definition at line 138 of file ntuser.h. 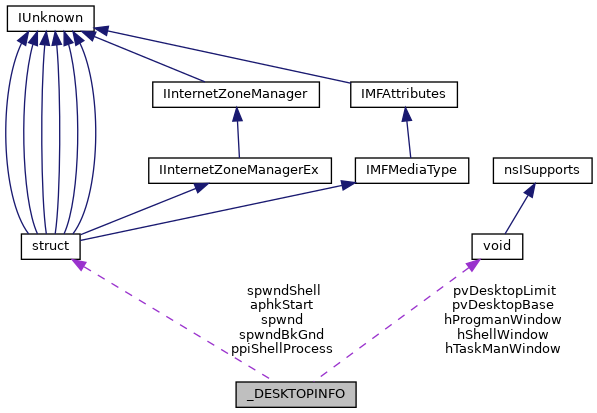 Referenced by IntGetGlobalHookHandles(), IntRemoveHook(), and UserInitializeDesktop(). Definition at line 150 of file ntuser.h. Definition at line 137 of file ntuser.h. Referenced by co_HOOK_CallHooks(), IntRemoveHook(), and IsThreadHooked(). Definition at line 141 of file ntuser.h. Definition at line 142 of file ntuser.h. Definition at line 140 of file ntuser.h. Definition at line 153 of file ntuser.h. Definition at line 146 of file ntuser.h. Definition at line 134 of file ntuser.h. Definition at line 135 of file ntuser.h. Definition at line 136 of file ntuser.h. Referenced by GetThreadDesktopWnd(), IntDesktopObjectDelete(), IntGetLastTopMostWindow(), NtUserMessageCall(), and NtUserSwitchDesktop(). Definition at line 144 of file ntuser.h. Definition at line 143 of file ntuser.h. Definition at line 157 of file ntuser.h. Referenced by BuildDesktopNameList(), NtUserGetObjectInformation(), and UserInitializeDesktop().